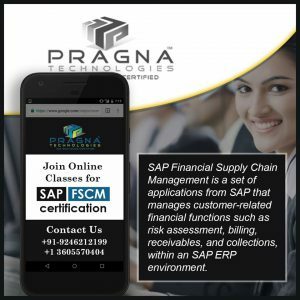 Enjoy the world’s best SAP FSCM Online Training Hyderabad, India only at Pragna Technologies to endeavour the unique experience. Creation of check number ranges. Define tolerance groups for vendor accounts. Integration with sap dispute management. 5. Automatic write off of dispute case. Closing operations in Fund Management. Checking working capital limits sanctioned, utilized and balance available. Money market, Forex, Derivites, Securities, Loans etc. For any Organization managing their Financial Assets is very important. SAP has given on Module called Financial Supply Chain Management to analyse all Financial Assets. FSCM gives different reports to improve its performance so join our SAP FSCM online training program in Hyderabad, India today. The students from Commerce background, with financial market experience, MBA, ICWAI, CA and having FICO Knowledge people are eligible to learn FSCM through our SAP FSCM online training program. So hurry apply now.